Betty Ann Brown review of Alex Kritselis: “Imperial Eden/After the Dissent’ in ArtWeek LA! Groundspace Project is honored to have its first exhibition review written by the esteemed art historian and critic Betty Ann Brown and published in ArtWeek LA. Entitled, “TRIPTYCH for October” Ms. Brown’s essay is a brilliant discussion of three “astonishing painting exhibitions’ currently on view in the Los Angeles area, comparing each exhibition to one of the three panels of Hieronymous Bosch’s Garden of Earthly Delights (1504), including Alex Kritselis: “Imperial Eden/After the Dissent”. ​References to words and texts evoke the writings of contemporary critical theorists, especially the semioticians, who deconstruct cultural products into constituent symbolic elements in order to analyze meaning. One of the godfathers of semiotics (the study of signs) is Umberto Eco, who is popularly known for his fiction, including especially The Name of the Rose, a murder mystery set in a medieval monastery. In the 1984 film version, Sean Connery plays the monk William of Baskerville, who follows some very literary clues to uncover the killer. … ​Kritselis titled the exhibition Imperial Eden/After the Dissent, with deliberate reference to world affairs and, especially, the political/economic quagmire of his home country Greece. Perhaps the most overt allusion is seenin the 84-panel silver grid that moves across one wall and rounds a corner to continue on another surface. 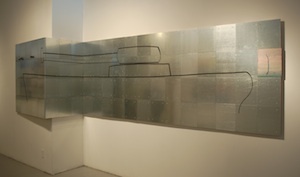 A thick black line describes a war ship, its guns and turrets pointing right to left, which means toward the viewer as she enters the gallery space. The ship does not appe ar to be super high tech. Indeed, it is old…which makes me think of retired weaponry, the shipyards of detritus that line the coasts of ancient foes. …​ Another cluster of panels presents the historic hero, St. George, on horseback, as he reaches down to spear a dragon. The image is created in glaring reds, yellows, and blues, so it is deliberately artificial in tone. 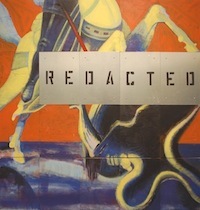 And across it, written on metal sheets that are bolted to the painted panels, is the word REDACTED. Viewers have to ask, What is redacted? The saint? His ancient foe, the dragon? Or perhaps the idea of doing battle with an ancient foe? ​Not all of Kritselis’s panels are figurative. One tall vertical piece is assembled from dozens of yellow panels piled into a pillar and crossed with lines of ted and black. Is it a computer reference? Networks? Are these red and black wires across an electrical device? Or is this, too, about conflict and violence? 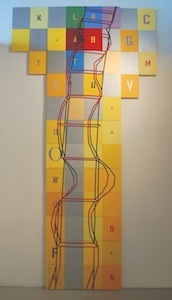 To read the whole essay follow this link to http://artweek.la/issue/october-21-2013/article/betty-ann-brown-triptych.